The Federal Aid in Sport Fish Restoration Act, often referred to as the Dingell-Johnson Act or the Wallop-Breaux Amendment, not only provides funding for sport fisheries management and research, but also funds projects to improve recreational power boating and sport fishing access. This legislation created a model "user pay/user benefit" program through federal excise taxes and import duties placed on sport fishing equipment, recreational powerboats, and gasoline used in recreational boats. The tax revenue collected by the U.S. Treasury is transferred to the U.S. Department of Interior, Fish and Wildlife Service, which is the federal agency responsible for administering the Sport Fish Restoration program. The Alaska Department of Fish and Game (ADF&G) is the only department in state government that is allowed to receive and use Sport Fish Restoration funds. This program will cover up to 75 percent of the cost of an eligible project and requires a 25 percent non-federal match, which is often met through the sale of sport fishing licenses. To help control program costs, projects often partner with other state agencies, and local governments. The ADF&G Division of Sport Fish has regional and statewide staff who work with state and federal land managers and local governments to identify and facilitate design and construction, and fund capital improvements and maintenance of boating access sites. 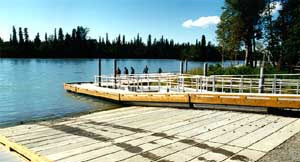 Projects are built to Americans with Disabilities Act guidelines and include boat launches and parking areas, restrooms, transient moorage, fish cleaning facilities, and other fresh water and marine access site improvements. The Recreational Boating and Access Program continues to assist in opening boating and angler access to many Alaskan waters, both fresh and marine. Over the last thirty years more than 160 capital improvement projects have been accomplished, which have provided new and improved access to waters throughout the state. Over twice as big as Texas, yet with fewer roads than Delaware, Alaska presents unique recreational access challenges. 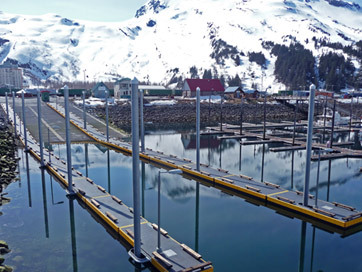 Even so, if you've ever fished or boated in Alaska, chances are you used a facility constructed through the Division of Sport Fish Recreational Boating and Angler Access Program. According to federal aid regulations, Sport Fish Restoration grants can only be approved if they primarily benefit the recreational boating and sport fishing public. These funds cannot be used for projects that primarily support subsistence, personal use, or commercial fishing groups. Subsistence and personal use fisheries are restricted to Alaska residents only and are therefore not open to the public in the federal sense. In addition, the "methods and means" used in subsistence, personal use, and commercial fisheries - gillnets, dip nets, and set nets - are not allowed in sport fisheries, and are thus not subject to the excise tax that supports the Recreational Boating and Angler Access Program. Other users may use a Sport Fish Restoration funded project, but such use cannot displace recreational boater and sport angler use. The Wallop-Breaux Amendment to the Sport Fish Restoration Act requires that a minimum of 15 percent of these funds allocated to Alaska must be used for recreational power boating access projects. However, there is no such requirement on the use of these funds for angler access projects. Funding requests for angler access projects compete directly with other Division of Sport Fish Sport Fish Restoration programs, such as research, management, hatchery support, communications, and habitat restoration. Since a large portion of boating access funds comes from federal taxes on fuel and recreational powerboats, project proposals that primarily benefit non-motorized boats (canoes, kayaks, and rafts) or diesel-powered boats do not qualify as recreational boating related projects. However, these proposals may be considered for Sport Fish Restoration angler access funding. Sport Fish Restoration boating access funds must be used only for constructing, renovating, improving, or maintaining access for marine or freshwater trailerable (under 26 feet), gasoline-powered boats. Examples are boat launch ramps, transient docking facilities, fish cleaning tables, parking areas, restrooms, land acquisition, and development for power boat use, and related support facilities. Sport Fish Restoration non-boating funds can be used for acquiring land, and constructing, improving, or maintaining public works such as sport fishing related parking and camping areas, trails, fishing piers or docks, fish cleaning tables, restrooms, and associated facilities that are not related to power boating use. Recreational access needs are assessed, and projects identified by the local Division of Sport Fish Area Management Biologist or Access Program staff. The local biologist submits a list of project ideas annually to the Access Program Manager, who then reviews and researches the projects to ensure adherence to program regulations and Division of Sport Fish Access Program guidelines. Project ideas are ranked using established criteria, and are then prioritized based on project validity, need, and funding availability. 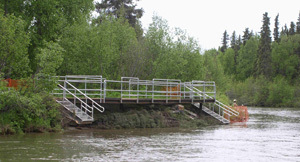 Information on ADA accessible facilities can be found at the Alaska Department of Natural Resources, Division of Parks and Outdoor Recreation website. Information about the Federal Aid in Sport Fish Restoration program can be found on the U.S. Fish & Wildlife Service website. Information pertaining to legal public access to the states land and water can be found here in the Legal Access section of the ADF&G website.